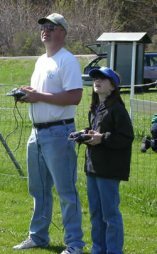 Learning how to fly RC planes is not as difficult as you may think. Unfortunately way too many people get excited about the the hobby, go out and spend hundreds of dollars, and wind up demolishing their brand new plane in about 20 seconds. But don't worry, that's NOT going to happen to you because you're doing your homework! To learn how to fly RC planes, you need to have a thorough understanding of how airplanes work. Get familiar with the different parts of an airplane and what they do. Make sure you know the physics behind how airplanes fly and what each flight control surface does. It be worth your time to learn a thing or two from the Wright Brother's themself! Whether you're getting help or want to learn how to fly RC planes on your own, a good first RC plane should be stable, self correcting, and forgiving. In other words, don't go out and buy an RC Jet as your first plane or any other highly unstable aerobatic plane. This is a very common mistake made by many beginners. But you're smarter than that! 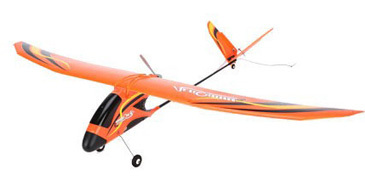 A glow powered RC trainer is a good choice if you have an experienced RC pilot at your disposal. Trainers are larger and much more powerful than park flyers and they need a larger area to fly safely. Park flyers are perfect for teaching yourself to fly RC. Their relative small size allow them to be flown safely at the local park or even your own yard if it's large enough. Made from plastic or foam, they are generally much more resistant to damage from crashes than larger trainers that are made from balsa wood. Get familiar with the basic RC airplane controls of the transmitter. The transmitter sends a signal to the receiver inside the airplane which in turn controls every function and control surface just as a pilot would in a real airplane. Depending on where you live, the controls of the transmitter may be set up a little differently. Transmitter mode 2 is what most people use in the United States. Find out the difference between transmitter mode 1 and mode 2. 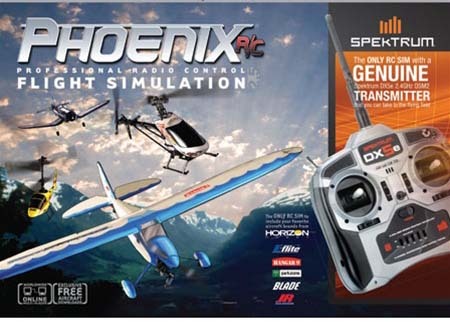 RC Flight simulators are worth their weight in gold as they allow you to learn how to fly RC planes without putting your pride and joy at risk! The physics and graphics of the latest generation of flight simulator are amazing. They're about as close to flying the real thing as it gets, except when you crash you don't cry! The hardest part of learning how to fly RC planes is training your brain to react correctly when your model is flying towards you because everything seems backwards! A simulator is perfect for etching this into your brain without tearing up your airplane. Don't think for a second that RC simulators are only for beginners. I've been flying RC for many years and Santa just brought me a new one last Christmas. 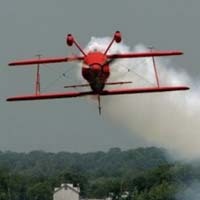 I sharpen my flying skills and practice new maneuvers without putting my airplanes at risk. It's also great to be able to fly when the weather is nasty outside. Long winters here in the Midwest! Simply put, RC airplane clubs are awesome. Where else can you hang out with a group of like minded RC addicts with a bunch of cool toys on a sunny Saturday afternoon? You meet some friendly guys, see tons of cool planes, and you learn a lot from the more experienced pilots. If you plan to learn how to fly RC planes with a glow powered or powerful electric plane, then joining a club is almost a necessity. An instructor at the local club will be more than happy to take your new plane up with you on the buddy box. He will even take it off and land it for you the first couple of times to make sure you don't demolish your brand new airplane! What's a buddy box? 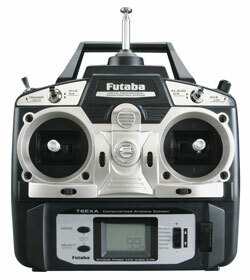 A buddy box is a training system where you use a transmitter that is plugged into the instructor's transmitter. 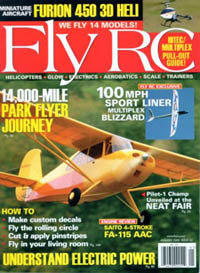 Subscribing to a couple of good RC related magazines will provide a wealth of information for getting started with flying model airplanes, and they come in mighty handy when you're on the thrown! Before spending even a dime, take the time to familiarize yourself a little bit with the hobby. This site is a great resource with lots of info and a great place to start. But also take a trip to both the local hobby store and the local club. Ask tons of questions, you will find that the folks in this hobby are the friendliest you'll ever meet. Don't hesitate for a minute to ask here if you have any questions along the way. I have listed a few books on the right hand column of this page that do a great job of explaining the basics of how to fly RC planes. They come quite cheap also, especially if you buy used. My personal favorite is Getting Started in Radio Control Airplanes. There are a few tools and gadgets that are needed to fly nitro-powered airplanes. Because they are used at the flying field these accessories are called field equipment. 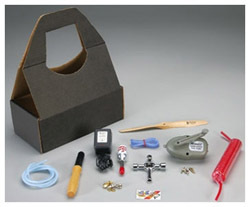 A full list of field equipment with recommendations at to what is required and what is optional can be found on the model airplane accessories page. If you live in the United States I highly recommend that you join the AMA. Most every flying club requires AMA membership in order to fly at their fields. This is because AMA members are insured for up to $25,000 should an accident occur while flying their RC airplane. As long as the AMA safety code is being followed of course. The Academy of Model Aeronautics is the governing body for radio controlled aircraft in the United States. There are many great things that the AMA does, but the most important thing they do is to work with Congress to insure that we can continue to fly our RC airplanes. It's only $58 a years. Here is the membership form. The closest flying club to me is about an hour away, so I decided to go at it alone with a relatively relatively inexpensive park flyer. I went through several sets of wings and two fuselages, but I finally mastered the old Aerobird! Truth is I would have been much better off driving the hour to the club. It would have saved me a ton of frustration and money. And guess what? I ended up joining the club anyway when I started flying glow powered airplanes. If at all possible, please get the help from an experienced pilot before taking to the friendly skies. Trust me, it makes all the difference in the world to get one on one help for those first few flights!